Would you like to turn your home into a holiday destination? Traveling creates lasting memories, where even the smallest memento can take us back in time to the sights, sounds, smells and emotions we experienced during our adventures. For all those other busy times of the year when we are unable to travel, experiencing those memories can bring great joy and happiness into our day. Every summer, we travel as a family to different destinations around the world. Over the years I have experienced over 50 international destinations and 160 Indian cities, each destination offering a unique experience. Along the way I have collected so many interesting artifacts, art works and other souvenirs. Each destination left a lasting memory and an imprint in my mind and heart. Each new location offered its own unique geography, landscape, vegetation, architecture, monuments and infrastructure. My travels offered me such amazing learning opportunities. I’ve used these experiences to enhance my design ideas, creating homes that feel like not only feel like a resort, but also homes that serve as a reminder of your favorite travel destinations. My visits to Switzerland, Rome, Rhodes, Sorrento and Mykonos in June and July 2014 were extremely memorable. Here, I discovered the neutral beauty of nature. These soft colors in nature almost spring to life against area vegetation and plants, creating an artistically inspired array that dazzles the eye. There are so many beautiful shades of green, each shade adding to the interesting depth of landscape. Regardless of where you travel, weather it’s snowy mountains, or a rushing river, nature creates of a rainbow of neutral colors! Within the neutral colors of beige, brown, black, white and grey, the various shades of greenery stand out. Nature is playful, meandering and harmonious. Adding these natural elements into our surroundings creates the feeling of total relaxation and bliss. I love natural landscape and try to incorporate nature into my design. 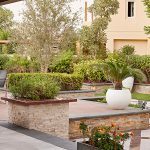 This featured garden we designed is so natural, serene and peaceful. Notice the calming water feature, where the lovely Lilly pads add a pop of green against the various beige rocks. The structured pathway seems to disappear, melting into its surrounding natural topography of greenery, pebbles and rocks. Add to that the soothing sound of the water and you really have created your own slice of heaven! One of my favorite holidays was to Rhodes, Greece where we stayed immersed in the heart of the old town. The architecture was stunning, with very interesting places to eat and shop. It was a very old historical place surrounded by castles. Drawing upon the inspirations of Old World charm, the roads were crafted of pebbles, inserted throughout the cement in intricately designed patterns that came to life with each and every step. It was extraordinary! Crazy cut pavings also highlighted the streets, creating intriguing patterns. You simply couldn’t look away! Pink Bougainvillea looked absolutely stunning set against the neutral grey and white road. When I traveled to St Moritz, Switzerland I fell in love with the local sights and sounds, and with a particular log of wood planter. It was so unique, I simply had to have it but it proved impossible to carry. When I arrived home I was determined to find a replica. I searched high and low and managed to find one here in Dubai! Placing it in the midst of the pebbles in my garden design added the culminating touch to the very minimal Zen design. Bets of all, it will always serves as a reminder of Switzerland and my quest to find the memorable piece that left such a lasting impression. In this particular design, I incorporated many pots and garden artifacts. The client loves to collect art pieces, sculptures, and candles. Adding these elements into their garden space is not only aesthetically appealing but it also serves as a constant reminder of their world travels. Each artifact provides the snippet of a memory from its associated destination. All hotels incorporate the latest materials, accessories, artworks and designs in their indoor and outdoor spaces. 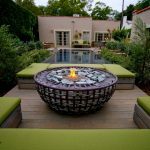 Vertical gardens, firepots, outdoor murals, and investment in custom LED lighting fixtures are among the latest trends. Though expensive, they create more than just a space. These accents create an elegant and glamorous environment. While traveling in France I came across this stunning vertical wall (pictured below). Vertical gardens create a vertical green wall that has a far more dramatic impact than tradition trees and bushes. It’s an enormous mass of lush plants, resulting in an awe-inspiring detail that leaves a lasting impression. As you can see in the featured design below, I use vertical gardens in my designs, adding the culminating finish to an extraordinary space. When it comes to incorporating your travels into your design, the possibilities are endless! As you embark on your next holiday, I encourage you to take pictures. Create a travel log to capture ideas that you love along your adventure. Collect art pieces and artifacts that will evoke memories for years to come. When you return home from your travels, we will help you design an extraordinary space that incorporates those memoires into your home. You may not always have the time to travel, but at least now you can have a space that serves as a constant reminder of your great adventures and the adventures yet to come!